I have preached before on the humility of Mary. This present homily was inspired by a reflection of St Ambrose of Milan on the relationship between the humility of God in Jesus Christ and the humility of his Mother, Mary the Theotokos. All our hymns and prayers rightly see Mary as exalted and honoured. 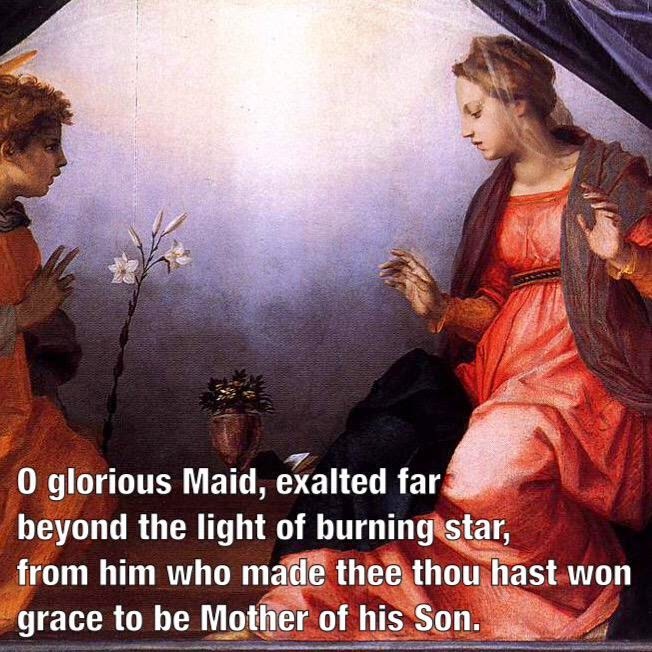 For example, when we ask for her prayers we begin with words from Scripture, with the words the Archangel Gabriel addressed to her, saying ‘Hail, Mary, full of grace…’; another example is found in one hymn we sing today that begins saying ‘O Glorious Maid, exalted far’. In these hymns and prayers we echo the words of the Magnificat as with all generations we call her ‘blessed’ (Luke 1:48). Yet, in our gospel reading today we see that Mary, after being told that she has been chosen to be the Mother of God, calls herself ‘a servant’. She says to the angel, “Here am I, the handmaid of the Lord” – meaning, “I am the Lord’s personal servant, I am one wholly devoted to fulfilling his will”. So we see that right from the first moment in which Mary could have claimed for herself glory and honour for being so highly favoured by God, she humbles herself before him instead, and speaking in humility she says, “I am his servant”. St Ambrose, one of the Church Fathers, commenting on this verse says ‘Behold now the humility and devotion of the Virgin’; look and meditate on these two qualities of Mary. Humility and devotion come from the fact that Mary is chosen to bring into our world Jesus, the One who himself is meek and lowly. At the Annunciation Mary accepts willingly to become the mother of the One who, as St Paul writes, ‘emptied himself, taking the form of a servant’ (Philippians 2:7); so she could not have displayed any other characteristic but the ones displayed by her own Son – humility and devotion to the Father. So here we have something to meditate upon as we try to live the Christian life. If we were chosen to be a key person in the next cabinet, or selected for a court honour, how would we react? Would we be full of ourselves? Would we be boastful? I think many of us would be. But I am asking this because we have already been chosen for an even greater honour; being a Christian far surpasses any of these examples. In Jesus God invites us to be his adoptive sons and daughters. There is no higher honour than this. But then how should we behave ourselves? Should we be proud and self-righteous? Should we look down on others because of our faith? By no means. At the Annunciation we have two examples of humility and devotion, one coming from the Blessed Virgin and other coming indirectly from her Son. In Mary we see a woman who could have claimed glory and honour for being highly favoured by God, but decided to remain a humble and devoted servant. In Jesus, who from that moment is taking flesh in her womb, we see the eternal and almighty God becoming a human embryo – something that nowadays society disposes of or destroys at will. Beholding and contemplating the holiness of Mary is good, but we have to go one step further and put our contemplation into action by living the Christian life according to what we learn from her; that is, living with humility and devotion to God, because only when we will be able to willingly say with her “Here I am, the handmaid of the Lord; let it be with me according to your word”, only then, we will have understood what it truly means to be a Christian.